We often hear the saying “local is lekker,” but what’s all hype about? Does it really make sense to choose locally manufactured items over imported ones? When faced with offers of better prices, free delivery, and every other bell-and-whistle to make your buying experience easier, many struggle to see the benefits of buying local. What are your reasons for buying local? There is more to buying local than simply supporting your neighbour or ensuring that your friendly farmer can send his daughters to school. Maybe it’s simply more convenient or affordable for you to pick local goods. If you are health-minded, perhaps you choose local produce and manufactured goods that are made or grown organically to support eco-friendly and anti-pollution ideals. But, why is it important to support local businesses? Let’s take a moment to look at the bigger picture. What do we mean by ‘local’? Buying local does not mean exclusively visiting your nearby farmer’s markets or pop-up shops. Supporting local businesses is so much more, and in an economic sense, it expands to include anything with a “proudly South African” stamp. When labour and resources are used from within our country’s borders, we generate a money flow system that benefits everyone within our borders. It provides more employment opportunities, and saves on hefty import costs too. Many proudly South African small businesses have grown to become large enterprises that you would not consider a “local” business, but they maintain their proudly South African ideals, often keeping actively involved in their origins. Most people support local by buying produce grown on nearby farms, or wooden furniture hand-carved in someone’s garage, without giving any thought to factory produced items or products. True, manufacturing plants are notorious for toxic waste, hazardous fumes and other environmental pollutants, but what about those select few that strive for zero pollution and toxicity ratings, and give more towards the environment than most? ISOTHERM is a product that is not only made from locally sourced materials, but from recycled waste products too. This form of insulation is made from recycled PET plastic bottles using a thermal bonding process. The manufacturing company responsible for this innovative polyester insulation is a proudly South African, local- and community-orientated BBBEE company. We have a strong sense of social responsibility and are committed to numerous community engagement, awareness and empowerment initiatives to help our nation grow, especially in sectors such as education, health, environment and housing. What makes ISOTHERM insulation “lekker”? We have a strong investment in research and development in order to continually create and improve products to meet the needs of South Africans. ISOTHERM thermal insulation is just one example of an innovative new approach to insulation. 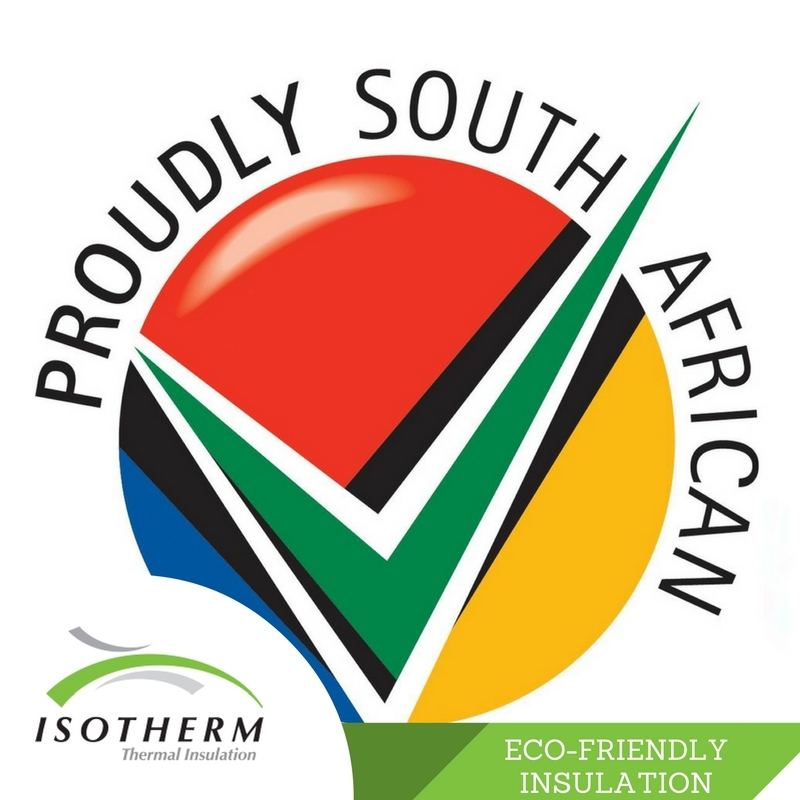 Many of our products, such as ISOTHERM, ISOFOIL AND ACOUSTISORB are firsts for South Africa. With expert developers and high-tech laboratories, our promise to South Africa is to continue to deliver exciting new revolutionary products. We are always on the look-out for better ways to keep our products fresh, relevant and cutting edge. As a South African company, we have a keen eye for what South African’s look for in a product. We know the market and cater for the average South African’s needs, from the suburbs of Sandton to the Cape Flats. It is our South African pioneering spirit that sets us apart in the market. We have earned a reputation for providing quality service and customer support. We guarantee supply, on-time delivery and quality products. With quick and easy access to technical information and advice, such as how to install your ISOTHERM insulation yourself, as well as professional installers to do it for you, you can find everything you need from us. We supply nationwide and have agents in every major province of South Africa. Our three factories in Cape Town, Johannesburg and Kwa-Zulu Natal offer fast distribution wherever you are. We are just a phone call or a website click away if you need advice or assistance with our products. We are invested in South Africa’s well-being; from the people and the economy to the environment. Ecological responsibility is the foundation of our business approach. ISOTHERM insulation reduces the use of non-eco-friendly materials and processes, both in the manufacturing and in the end product used by our clients.